I grew up in a frugal household. After witnessing Houston’s boom and bust in the 70’s, my parents were classic penny pinchers—they clipped coupons, insisted I bring my lunch to school, chose the library over a bookstore for fresh books, flew Southwest Airlines, championed the benefits of a free education and encouraged me to earn and save my own money. And no fancy restaurants for my family—instead you’d find us every Wednesday walking the line at Luby’s. Why? Because on Wednesdays, kids could eat for free. While Luby’s was never cool, I actually enjoyed my weekly meal there. The possibilities were endless, a 30-foot long buffet of whatever you wanted. You’d start with the Jello, lettuce and fruit salads, then slide your tray along the rails to the meats (where there was always a whole nicely browned turkey and juicy hunk of prime rib just waiting for carving), then the vegetables (yes, macaroni and cheese is a vegetable), the breads (clover rolls, cornbread and Texas toast), the desserts (cream pies, cobblers and more Jello) and the drinks (Coke, milk and iced tea). I’m stuck in my ways, so I always ordered the same thing, a Lu Ann Platter with fried fish, mashed potatoes, green beans and a roll. When I became a rebellious teenager, however, I switched from fish to liver and onions and added fruit salad and corn bread to my meal. But it didn’t matter what I ordered, it was always lip-smacking good. Luby’s recently celebrated its 60th anniversary and there are a couple of new books to hallmark the occasion. First there’s Luby’s Recipes and Memories Cookbook, which has all of its recipes, from lime congeal to the very popular fried fish. 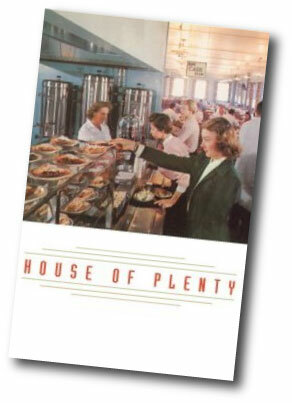 There’s also a new book from the University of Texas Press called House of Plenty: The Rise, Fall, and Revival of Luby’s Cafeterias. This fascinating look at Luby’s is one-part business primer, one-part Texana, one-part food history with a little bit of true crime to keep it spicy. It’s scintillating reading even if you’ve never been to a cafeteria. Not only do you learn how to treat your staff, you’re also made privy to Luby’s recipes (reprinted as they were originally typed) and discover why Texas allows concealed weapons. Of course, all this reading doesn’t beat the real deal—making a trip to the local Luby’s—but it satisfied my yearning just enough until the next trip home. I leave you with Luby’s recipe for liver and onions, my old badge of youthful insurgency. You may be asking, “Why not the fried fish? Everyone loves those perfect rectangles of crunchy, moist, flaky fish!” to which I reply: when was the last time you saw a recipe for fried liver on a blog? What are your favorite dishes at Luby’s? Do you have any Luby’s memories to share? Season the liver with salt and place in a mixing bowl. Cover with water and let it soak for 15 to 20 minutes. In 10-inch skillet, melt butter over medium heat. Add onion and cook, stirring occasionally, until tender and lightly browned. Season with salt. In a shallow bowl, whisk together milk and eggs until well blended. Place the bread crumbs in separate shallow bowl. Rinse the liver under cool running water and pat dry with paper towels. Dip into milk mixture, then into bread crumbs, coating evenly. Add liver and cook 2 to 3 minutes on each side or until cooked through. Top with onions. I have gone on with friends, family, my parents,–anyone who will listen to me,–that your blog never fails to conjure up the things I remember most about my childhood. And also about the things I love most about food. First It was Rotel, then tamales, then Mi Tierra, and just when I thought you couldn’t take me back any farther you just did. I’m calling my parents to read this IMMEDIATELY. And then I shall sit back and think about sliding my tray down that long, long line, smiling and telling the older women behind the counter that I’d like Texas toast and extra gravy on my potatoes. Oh, and as far as favorites, you mentioned everything I have possibly ever loved at that Cafeteria. It was the only time I was allowed to load up on carbs and sides without my folks ever fussin’. Yay! A recipe for liver and onions on a blog! Bring offal back, it’s so delicious and underrated…I’m serious. Too cool! My husband (though a native New Yorker) lived in Austin before he met me and still talks of Luby’s fondly. Thanks for the tips! Matt–Thanks, you’re so sweet. I’m glad I’m making someone happy (and hungry)! Isn’t it funny how going to Luby’s was considered healthy eating? Man, I could go for a big, thick, buttery slice of Texas toast right now. Nosheteria–Awful good that offal, yes indeed! Rachel–You’re welcome! I’m going to experiment with the fish recipe and will post the results soon. PS You brought back other fond but more recent memories with two words: Texas toast. A few years ago, I become obsessed with it, going places that served it and buying the *shudder* frozen kind in grocery stores. Mmm, unless that’s fake Texas toast (essentially really thick, grilled garlic toast? )… I think I want some now! For posting a recipe for fried liver, you have my neverending admiration! For this evocative and thoroughly entertaining writing, I’m sending a huge smile your way! When I was growing up in Houston, my family went to Luby’s every Sunday after church. My Lu Ann platter always included the fried fish; I was a little more flexible about the vegetables. My mother usually got liver and onions, because she was the only one in the family who liked them. i actually get a hankerin’ for liver and onions every once in a while – and i can’t stand liver OR onions. must be an iron deficit in my body. or… perhaps… nostalgia for luby’s. growing up, we had a luby’s cafeteria and about a mile away a furr’s cafeteria. as with matt, your post conjured up memories of sliding a hard plastic tray past congeal salads and clover rolls… and asking for WHITE gravy – not brown – on my mashed potatoes. i don’t think i ever once visited luby’s (or furr’s) without getting mashed potatoes and white gravy as a side. incidently, i live about 15 minutes away from the luby’s in killeen where the massacre took place 15 years ago. they tried to re-open their doors several years ago, but sadly it was not successful. around these parts, there is still a lingering stain on the “luby’s” brand, but like many stains it has faded over time. i have always loved luby’s and i still do! Yvo–I remember Sizzler, but for some reason we didn’t eat there. Maybe they don’t have them in Houston. Texas toast is indeed the tastiest, but I’ve tried the frozen kind–it just seems like such a weird thing to buy. Ivonne–You’re so sweet! And I’m smiling right back at you! Melissa–White gravy is the ONLY gravy for me! It’s impossible to find in the Northeast, everyone seems to prefer brown (and at most diners it tastes like it came out of a jar). I thought of you when reading the book because I reckoned you live close to the Killeen Luby’s. I’m not surprised it couldn’t stay in business…too much bad history. We didn’t do a whole-lotta Luby’s but there was one in North Star Mall. I remember those big, family mall days – everyone scatter an meet at Luby’s at 4 – which always culminated with some Mac & Cheese (and other stuff). We didn’t have Luby’s where I lived – we had Piccadilly. Seems I can’t find anyone who ate at a Piccadilly unless they were from a “small” town. Now however, in DFW, I can eat Luby’s whenever I want! I *always” get jello and cornbread and the mac n cheese. Suburban Housefrau–When I showed the book to my Cajun friend from Opelousas, he said Luby’s was considered big-city dining and his family had to make do with the local Piccadilly. No matter, going to the cafeteria was still considered a big deal. Oh my, where have I been? I love your site. I stumbled upon it while looking for a Barbacoa recipe. I grew up in Texas but now live in California. I loved the Luann platter of breaded beef cutlet. Not to forget What-A-Burger either. Luby’s is where I first learned to eat fish as a child, other than fish sticks. I loved that huge piece of fish and how flaky it was. To this day, I still eat fish there every time I go. I know that the green beans are super over-cooked, but they so remind me of the way my grandmother used to cook them to death. I don’t cook Liver and Onions so hubby gets his fix at Luby’s. Thank goodness they do that stuff there UGH! I prefered the liver and onions at Momma’s Haufbrau in SAT! I remember eating at Luby’s, my grandmother LOVED that place.. I remember greenbeans.. mushy buttery ones.. I liked them. I understand your nostalgia but I never got it for Luby’s. I am nostalgic for Dairy Queen (the ones I knew in the midwest) and I miss Taco Cabana and any real tex-mex food.. (nothing like that here in MA, I promise you). Cindy–Oh yes, I never, ever forget Whataburger. Vickie–I love the green beans–they’re so overcooked they’re almost bacon-flavored mush. And lucky for your husband Luby’s makes such terrific liver! Nika–The cafeteria was the only place my grandparents ate out when I was young. The first time I ate with them at a non-cafeteria restaurant was almost disconcerting, it just seemed odd looking at menus with them instead of sliding a tray. As for Taco Cabana, I’ve written letters asking them to PLEASE open on the East Coast. Growing up in Texas, Sunday lunches at Luby’s were a tradition. When I moved to NYC in the nineties, I was surprised that people considered cafeteria food sub-par. Having eaten at Luby’s all my life, I considered it pretty darn good. As a child, my standard meal was friend chicken, mashed potatoes, green beans and chocolate milk. My daughter now eats their fried chicken and I can tell you, it tastes the same and smells the same to this day. Until I was about 13, my parents forbid me to get any dessert other than Jell-O. When I outgrew the Jell-O, my favorite dessert became their Boston Cream Pie (cake). Luby’s makes it with chocolate cake, chocolate icing and white filling. In fact, the only thing it has in common with traditional BCP is the filling. BTW. I have grown-up friends who swear that the Luby’s Jell-O tastes better than any other. Thanks for the Luby memories! Funny thing too, Liver & Onions was my Mom’s favorite dish at Luby’s. You’re probably way too young to remember the place, but before Luby’s, my family would drive across town (in Houston)to a cafeteria on Wayside Dr. called The Dinner Bell. I can still picture their sparkling jellos and steaming bowls of mac & cheese. Anna–According to the book, Luby’s is quite proud that it’s used the same recipes for years. And I think that’s why people love it so much–things taste the same as they did when they were young. I grew up on the fried fish, too. With mashed taters and mac and cheese. Never, never the LuAnn, though. Texas toast was a must, and egg custard for dessert. It still makes my mouth water. I left Texas for 3 years in Connecticut and 4 in Vegas and really misssed Luby’s. Nothing else even comes close. I am back home in Beaumont now and Luby’s is within walking distance. This is good, because I usually still make the same menu choices as when I was a kid and the exercise is necessary. One change I’ve made voluntarily is that I no longer get chocolate milk with my fish. What was I thinking 40 years ago? Other changes were not by choice. Egg custard seems to be a thing of the past, and I haven’t seen Texas Toast lately, either. Still, I like to mix the tarter sauce and ketchup into a tasty pink goo for the fish. And since my brother-in-law is a Luby’s manager in Houston, Christmas always brings a gift card. In fact, I may take a walk down the street and walk the line tonight. What the heck, it’s already paid for! I’m still here in Houston. I remember enjoying Wyatt’s Cafeterias in the mid-late 70’s as well (mostly in the malls, I believe). I love the baked mac ‘n cheese, the breaded fish and the cafeteria ladies. A dozen desserts to chose from was always a treat as a kid. I haven’t been in years – thanks for reminding me what I should be appeciating! Hello, there! I sure hate to burst your bubble, but the Luby’s we once knew and loved has been taken over by evil corporate suits. Since chain restaurant Papadeaux’s..(not sure on spelling) took over Luby’s it is not the same. I am so sad to say also, because I loved their down home charm and of course the way the food used to be. At least here in Brownsville, the changes are obvious. No more real butter…margarine. Yuck!! Now the steam table has been replaced with ceramic dishes that do not keep the food hot and possibly cause it to be undercooked. No more tea lady with her cart going by your table…Now they have attendants..not as good…and now you are tipping for partial service. And the prices have gone way up and the quality of the food has gone way down. I could understand and even be happy with the price going up if the food was still the good ol’ Luby’s but not for this mess!! And the desserts have all these funky gourmet-wanna-be garnishes. Just give me my dessert with a big blob of real whipped cream and I’m happy! But let me end on a happy note. If you make it to the Valley, you have to go to Blackbeard’s on the Island, that’s South Padre Island, They have the best seafood, mammoth burgers and the most gigantic, tasty, crunchy onion rings you will eat, not to mention they have a chicken fried steak plate with mashed potatoes and gravy, green beans and texas toast that will rival any at Luby’s. Pokerboss–Ah, yes…it’s all about the fried fish, isn’t it? I have the recipe and will do a post on it soon. One of the ingredients was a big surprise! Anonymous–I remember Wyatt’s, too, but I always thought that was more a Dallas institution vs. a Houston one. For some reason we were a Luby’s family, not a Wyatt’s but I don’t know why. Maybe kids couldn’t eat for free at Wyatt’s. Leigh–That’s ROTTEN news! What a shame. What are they thinking??? Man, I am glad to have your site. For me, Luby’s is always LuAnn fish, but not the fried one, the one with the baked topping (I think it’s just mayo), with fried okra and macaroni and cheese. And of course, an unethically large “bite” on my mom’s liver and onions. I wish I could have some now. I lived in Phx for awhile in the late 80’s and my ex’s dad loved Luby’s. He would take us there all the time. Unfortunatly, now I can’t help but think of that horrible shooting when I think of Luby’s. Wow, this brings back the memories. We always went to Luby’s for Sunday afternoon after church. My order of choice was close to your: LuAnn with Fried Fish, mac & cheese and fried okra. My later years I’d go for the breaded beef cutlet or even the beef liver during college. My mom was a beef & chicken liver fanatic. Thanks for sharing the recipie. Can you believe that I’m 55 years old and I went to Luby’s when I was a kid? And they had the same food you’re describing? But Leigh is right–it is no longer the same and we no longer go, sadly. I used to have their cheesecake (fluffy and light instead of dense) every single time. And I didn’t get the fish–I got the roast beef! With the au jus. Oh, man… And I predate the LuAnn platter, so when we ordered we had to promise our parents we could eat everything we took. Thank you for validating my obsession with Luby’s and with Texas food in general. As a sometimes homesick Texas exile in San Francisco, I have no one to share my guilty secrets about the things I actually *like* (gasp) about Texas. The food is one of them. Like michaela above, I’m a strict follower of the LuAnn with fried fish, mac & cheese and a side of fried okra. Bay Area friends would cringe but my Houston people know what I’m talking about! Very glad to discover your blog (via Simply Recipes)…best of luck! I used to live in Killeen. I got there in 1992 a few months after the shooting at that Luby’s. Once they put up some barriers and re-opened, I would go there for lunch quite often. I LOVED their roast chicken and new potatoes. My daughter also loved going there. She was forever asking if we could go to Luby’s for lunch on Sundays. Unfortunately, I guess business never really picked back up and it closed in 2000. It’s now a chinese restaurant which is actually quite good, but I do miss the Luby’s. The closest one in now in Temple about 20 minutes away, I believe. I was born and raised in Texas. I frequented the Luby’s in Waco. Then later after getting married, my husband and I would frequent the Luby’s in Galveston. I love their waldorf salad, and the carrot salad is pretty fabulous. The baked eggplant is too yummy as is the twice baked potato. After we would eat we would always sit and drink coffee and visit with Patricia Crow, the lady who brought around the tea and coffee. Yes, it wasn’t a ‘cool’ place to go. We were in our 30s and always felt right at home with their gracious staff. What great memories. Oh my goodness, would you believe that the vegetarian options at my wedding were fetched from Luby’s?! Some sort of cheesy squash dish and… I can’t remember the other. The rest was delicious South Texas barbecue. But my husband was born and raised in El Paso, so Luby’s comes second hand to his family – that and Whataburger. East Coaster myself, I thought, cafeteria food? at my wedding? But you know, of course, that squash dish is what everyone reported back to me as what they loved the most. Go figure! I just ordered this book for my husband, he’s going to die! Thank you for this blog, myself and my own homesick Texan *love* it! wow…I am SO identifying with every post of yours I read. I found your blog by asking google how in the world I make sopapillas…and then I discovered that you love luby’s too! I’m a LuAnn Chicken Fried Steak with double macaroni and cheese, so I’m out on the fish…but I can appreciate someone else having love for Luby’s! My family is from Oklahoma (which still counts as tex-mex country, sort of) but lives in asia, so now it’s all up to me and my kitchen to recreate tastes of home. thanks for the great thoughts and memories about food from home. I’m loving it! I grew up in San Antonio and Luby’s was a favorite place for lunch after church. My little brother ALWAYS got fried chicken, mashed potatoes, red jello, and a cloverleaf roll. He now lives in California and we always have to go to Luby’s when he comes to visit us here in Austin. He still gets the same thing (minus the jello). I’m a big fan of the fried fish and turkey and dressing. Our kids love it too. It’s just a Texas thing I guess. Everytime we go we still talk about what my granny used to always order at Luby’s: liver and onions, half and half (that’s a half order of cole slaw and a half order of carrot-raisin salad for you rookies), green beans, and mincemeat pie. Good times!!! HomesickTexan, I completely understand the longings for Texas cuisine. For several years my husband’s job caused us to live in the Caribbean, Louisianna, and Arizona. We always longed for Luby’s, Whataburger, and of course Tex-Mex. You’ve got a great little blog going here. Very clever! Randi–Yes, it’s a shame that the memory of Luby’s has been tainted by that awful shooting. Michaela–You’re welcome. I LOVE the fried fish! Cilantro–I can completely believe the food has remained the same througout the years. I also remember the roast beef–that big hunk of meat they’d slice for you when you ordered. It was magnificent! Belle Gone Bad–Sounds delish! They make a mean chicken-fried steak! Jen–As a fellow Houstonian, I definitely know what you’re talking about! Purkeys–Yes, it’s terrible what happened in Killeen. I guess they could never recover their business after the tragedy. Anon–It certainly wasn’t considered cool, but you’d be hard pressed to find any Texan who doesn’t love Luby’s! Nissa–Oh yes, squash casserole is always a big hit with Texans, and so easy to make! How fun (even if you were horrified!) that you had Luby’s help cater your wedding. Rachel–You’re welcome! The LuAnn platter seems to be a very popular choice. And I LOVE Luby’s mac and cheese. I’d alternate ordering that with their pleasantly lumpy mashed potatoes. Penny–Never heard about the half-and-half, but it sounds terrific. Carrot and raisin salad is definitely a Texas treat! And yep, any Texan who leaves the state eventually gets a real craving for the foods we grew up with. I’m so glad I found this blog!!! I’m a native Texan living in the middle of nowhere Western New York and I miss my BBQ and tamales and Luby’s! I always got the Lu Ann platter as well, until I hit my vegetarian kick in high school. A few months without BBQ and that was over though. Awesome stuff! I feel so lucky to be a native Houstonian, because we have the best variety of foods in the U.S. Fresh seafood, wonderful Tex-Mex, great Cajun style cooking, Italian, Asian – oh, and I almost forgot – fabulous Steaks! The one time I managed to take a 2 week vacation and flew home, I spent all the time there eating out an all my favorite spots for dinner/ lunch. The Loaded Baked Potato… Chopped Beef BBQ on a potato. They dont think of that here in ohio…. Kolaches… the breakfast staple… nope.. not up here either. Only place up north I have found them is in the Dunkin Donuts in Chicago Airport. I’m a Port Arthur native living in Yankeeland. My mother took me and my sister to Luby’s once a week when we were kids. My regular meal was the salmon croquette, mashed potatoes and a cloverleaf roll. (Had to get marg for the roll because it was a penny cheaper than the butter!) Nowadays, when I visit family, I take my husband to the Luby’s on Sunday for lunch, so we can watch the church ladies in their hats. He gets chicken-fried steak. I get something on a LuAnne plate. And I get that roll with butter. The African American church ladies in their hats! The previous blogger is right! The British don’t have anything over on them! I thought that was only at my Lubys (in Tyler). I wish I had taken pictures through the years. I stumbled on this blog looking for some Luby’s recipes. All this time I thought I was the only one who loved Luby’s this much! I always joke that instead of having a favorite memory of grandma’s house, it’s Luby’s for me. Remember those thumbprint rimmed coffee cups and saucers? (I wish they hadn’t switched to mugs.) I’m so glad Luby’s is still open! For a little while I was worried. I’m afraid they don’t advertise enough and it’s a great place for families. For me, the most signature taste of Luby’s are their greenbeans. Besides, the bacon grease, I still have never tasted a canned green bean like theirs. I wonder what company they get their beans from? I am a native of Victoria, Texas and we have just lost our Luby’s that I grew up on. It closed last year. I cried. My favorites were many- Macaroni & Cheese, Coconut Meringue Pie, Mincemeat Pie, Apple Pie- & so many more.We have a Furr’s- But it’s not the same.I don’t go there. Instead I am trying to get the recipes for my favorites & cook them myself. If you find the recipe for Mincemeat Pie please let me know. Yeah, Luby’s has always been a fond childhood memory. the Luby’s Fried Fish and Mac and Cheese!! mmm I actually came upon your site because i was actually looking for the Luby’s Fried Fish recipe…i have the Luby’s Recipes and Memories and it is NOT in there – there is a recipe for Fried Catfih – but that is not the same as what is called Luby’s Fried Fish. i think we found out that the fish was rolled in patatoe chips. If anyone has the recipe i would love to have it. To Nika – sorry to say, Taco Cabana is no good anymore!!! Luby’s visits were always a treat! I’m from San Antonio and my grandparents were my babysitters during the summer and we frequented the Luby’s at McCreless Mall. Liver and Onions for Papa and Enchiladas for Granny! I loved the fried fish but grew to love the turkey and dressing more. I now have a wheat allergy which limits my choices, but there are still plenty of them here! Oh, and always the coconut cream pie!!! YUM! Not any more tho…:( so sad. I’m in Austin now, and still include Luby’s in my dining choices. Does anyone know how they make their French cut green beans with bacon and onions? I love them!! My family and I have enjoyed Lubys for years and Yes we go on Sat when kids eat for free.. I think my favorite meal is the turkey luanne with cranberry sauce, dressing yummy!! If you’re looking for another replacement for Luby’s Cafeteria, check out the Cleburne Cafeteria, the food is still very much the same as it has been for since 1941. I miss the old Luby’s but this is the next best thing. Growing up in Lubbock I too have fond memories of Luby’s; and yes I am a homesick Texan living outside Chicago. I always got fish, or their wonderful chicken and the homefries. I do have to say my favorite was Underwoods BBQ, I think they called it a BBQ smorgesboard. My family also frequented Wyatt’s Cafeteria (I have a couple of their pie pans in my cabinet) I also, miss Bedfords Steakhouse (home of the worlds larges salad bar). Does anyone remember when KFC sold BBQ ribs, and had rolls instead of the hockey puck buscuits? I used to like DerWienersnitzel too? I think all those places are gone now, so now when I go home to visit I just head for Sonic and Jack in the Box, and Oh My God “Blue Bell Ice Cream! The area I live outside Chicago has some good pizza, chicken, Chicago Dogs, and prime rib, but it’s all so bland compared to our Texan cooking. None of the stores up here even sell brisket, so I haven’t been able to smoke anything but ribs. I’ve been vowing to drive home just to bring back some supplies; I just don’t want to deal with trying to keep it from spoiling (17 hour drive on a good day). Glad to speak to some fellow Texans, Happy Holidays! Anonymous… That sounds like a type of frozen waldorf salad. I don’t know if all waldorf salads are frozen though. If anyone has Wyatt’s Chocolate cake recipe let me know. That was the best. I grew up in Lubbock so I'm a huge fan of Furr's however when we went to the metroplex to visit family we would always head over to Luby's. Does anyone remember coming in early from playing outside so we could take a shower and then put on "good" clothes or dressing for supper. Last week the Dallas Morning News reported that the Pappas brothers (the restaurant family that bought Luby's) are closing 10 of the cafeterias in Dallas/Ft Worth. Not surprised – when I ate at the one in Plano a regular plae of roast beef, two vegetables, roll, pie and iced tea was $12.00. I LOVE your blog! Fun to see a slice of home. I lived in West Texas for 23 years and raised my kids there. Luby's was the only place I could have liver and onions so I'm super excited to see their recipe. We ate there about once a week and it was a perfect place to take kids – everyone was happy! I have been talking about Luby's for years and have always missed having their liver and onions. I,too,am a Homesick Texan. I bought liver the other night just for me and everyone was making their comments about liver and onions, including the cashier. I began to tell them where I had learned to eat and love liver and onions. It was of coarse Luby's. I haven't had liver and onions that good since I left El Paso. And when I lived in Corpus Christi, I introduced my children and grandchild to Luby's. It fast became my daughter,s favorite place to eat and my grandson at the age of two loved their liver and onions. He called it chicken, he called all meat chicken. Anyway, I tried cooking my liver and onions by memory and what I thought might be in it. Boy, was I wrong. It didn't taste the same at all. So, I googled a recipe for liver and onions. I got the normal recipes. I then hoped to find Luby's recipe and found you. I must tell you, I cried while reading your blog. I didn't realize how home sick I was. Is Texas really as good as I remember it? (Twice) Loved your blog and Thank you so much for the recipe. ahhh Luby's I forgot it was called the Lu Ann Platter 🙂 thanks for the reminder, I really think I'm going to get that book too. OMG, Luby's "saved" my college roommate & I from the horrors of dorm food at TCU. We went once a week to Luby's for vegetables. We each got several selections plus always Mexican Cornbread. Don't really know that the Luby's version of vegetables (any vegetable) was actually healthy but it was college survival at it finest! I'm going to e-mail that very roommate right now to read this!!! I grew up in El Paso and we made the trip at least once a week to eat at a cafeteria. I liked Furrs the best but was thrilled to go to any cafeteria. I went back and forth between the Chicken & Dumplings and Turkey and Dressing. My little brother always got liver and onions and I always had to have a bite of his. Always chocolate pie for dessert. And sweet tea. We used to walk to Whataburger and I remember a DerWienerschnitzel too, though hot dogs weren't my favorite. I love reliving those days through your blog! The Luby's on 67 & Cockrell Hill in Dallas has the best tasting food in Dfw. The others are not that good. I remember going to Wyatt's cafeteria as a kid, only on Sundays. Good times!!! !